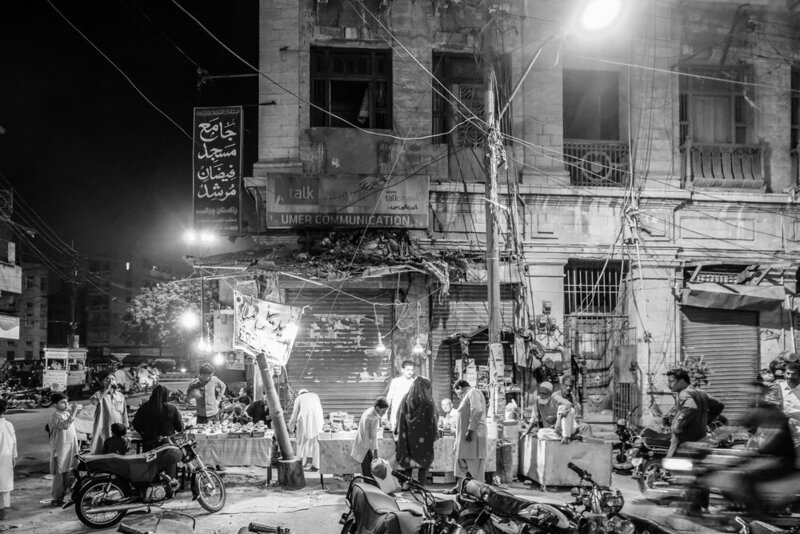 Karachi is a city, monstrous in size, sprawling and organically expanding constantly. Once known as the city of lights in it's heyday in the 60s and 70s, now it's more like city of hustle. It pushes itself to the very limit with one of the most highly populated lands in Asia. Karachi's so rich in history it's kind of epic. The Karachi region was visited by the Greeks and Alexander the Great himself prepared fleets for Babylon here. It's sad to see it so dilapidated and run down, even old colonial buildings are not kept well, so they all seem to sigh and bemoan their dirty states. Though KHI has always been a hub for business and travel, the infrastructure barely holds all the feet on the ground. It's a tough city to be on foot in, but the amount of faces and colors and visual stimulation makes it worth it when you walk through the hustle and bustle through one of it's busier areas on a Friday night at the end of Ramadan.